IndieCommerce Can Probably Do That For Your Website! 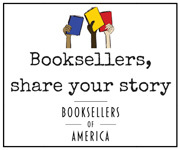 IndieCommerce™ is the ABA’s e-commerce platform for independent bookstores. The system provides the tools for indie bookstores to create unique, content-rich, and easy-to-operate, fully transactional, e-commerce enabled websites. Over the past few years, the IndieCommerce team has been working closely with booksellers to to help them achieve their online marketing and sales goals. This session will highlight some of the most impactful changes that individual stores have made to their websites over the past year, including before and after examples.